Enjoy an amazing 3 day Fraser Island tour staying at Eurong Beach Resort for 2 nights. 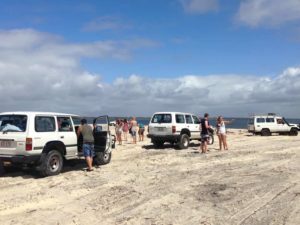 If you have time on your hands and want to see all there is to see on the largest sand island in the world, then this Fraser Island 4WD tour is for you! Get a thrill out of driving around in a 4WD on Fraser Island for 3 days, 2 nights. Explore all of the natural beauty this World Heritage Listed Site has to offer. Cruise along 75 Mile Beach – the island’s official road! 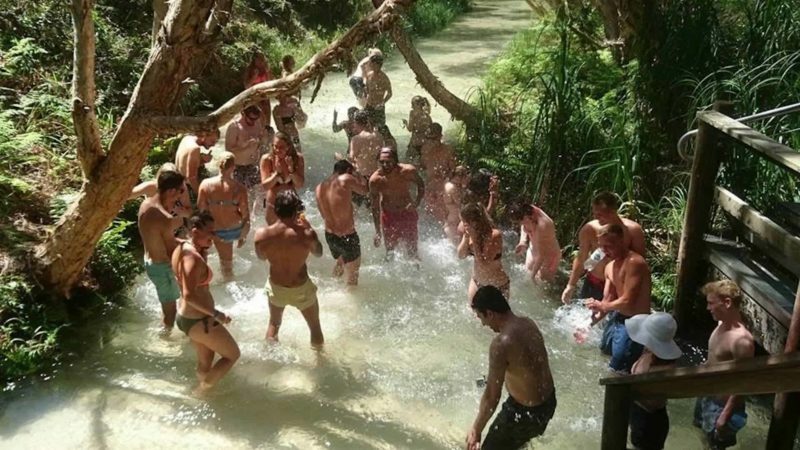 Enjoy bushwalks, refreshing swims at Eli Creek, Lake McKenzie, Lake Wabby and Champagne Pools and the stunning views from Indian Head. 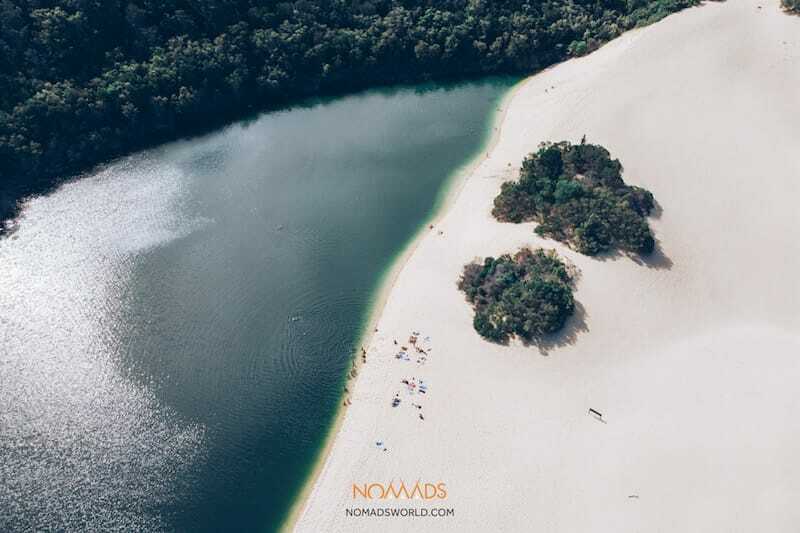 Explore the natural wonder that is Fraser Island with Nomads. A knowledgeable and professional guide. Exclusive post tour party at KB’s Bar! Local fees are also included. 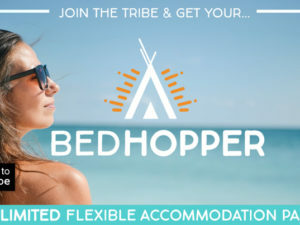 You’ll enjoy a comfortable 2 night stay in a 6 bed dorm at Eurong Beach Resort Fraser Island. All of your meals while you’re on the island are included in the price of your 3 day Fraser Island tour. Fancy camping instead? Check out our 3 day camping trip. 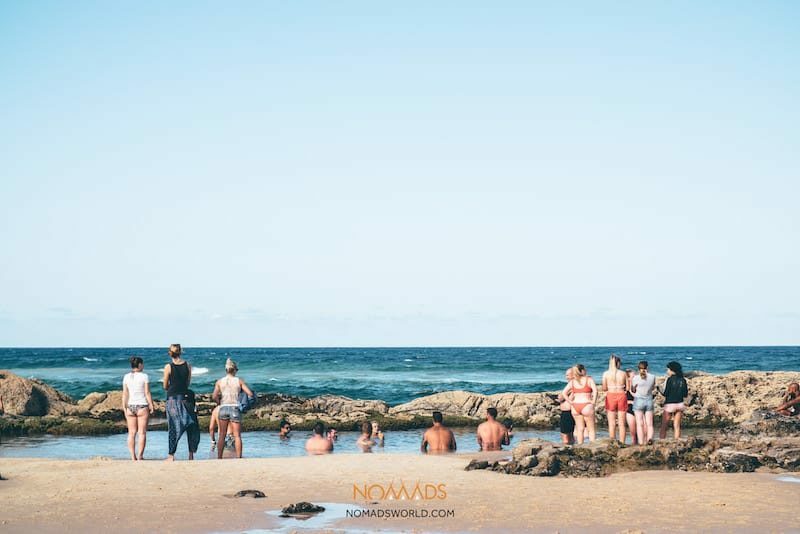 Pre and post tour accommodation in Noosa is not included but for a small fee you can add extra nights at Nomads Noosa! 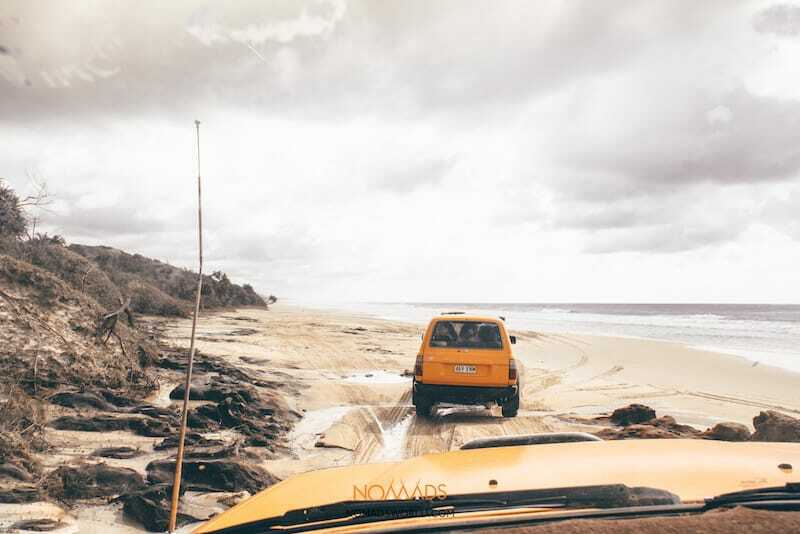 Prior to your Fraser Island 4WD tour you must attend our compulsory pre-tour safety briefing. This is held in Noosa at KB’s Bar at 6pm the day before the tour departs. If you want to drive you must be a minimum of 21 years of age, currently hold a valid drivers license and have the ability to drive a manual car. A refundable insurance cash deposit of $250 per person must be paid, which will be refunded in full provided the vehicle is returned undamaged, or you can pay a non-refundable $10 excess reduction fee. So what to bring on this cool Fraser Island adventure? Pack a small backpack with your camera, a valid current drivers licence (for those who want to drive), sunscreen, insect repellent, a hat, appropriate clothing, toiletries, linen (also available for hire) and snacks. Visitation to all attractions is subject to the island’s conditions, tides, weather and time constrictions. 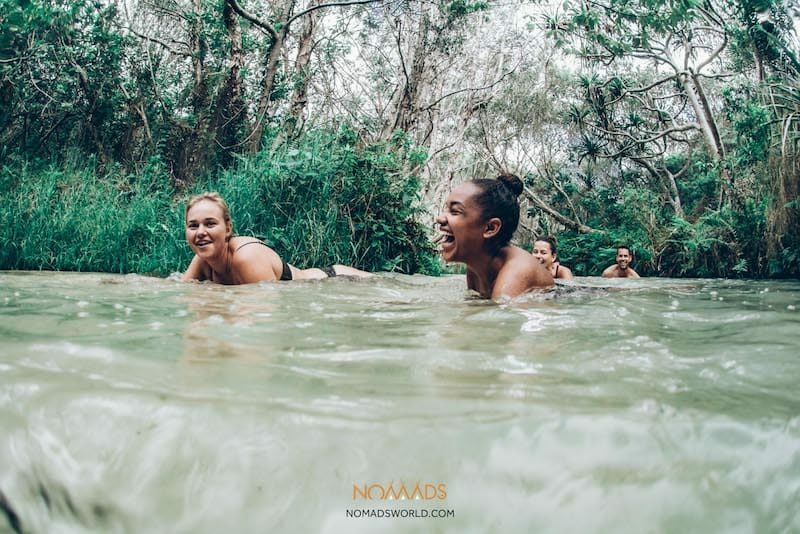 When you arrive in Noosa, check in to Nomads Noosa Hostel, located at 44 Noosa Drive, Noosa. You must arrive before 6pm for your compulsory safety briefing being held at KB’s Bar at the hostel at this time! 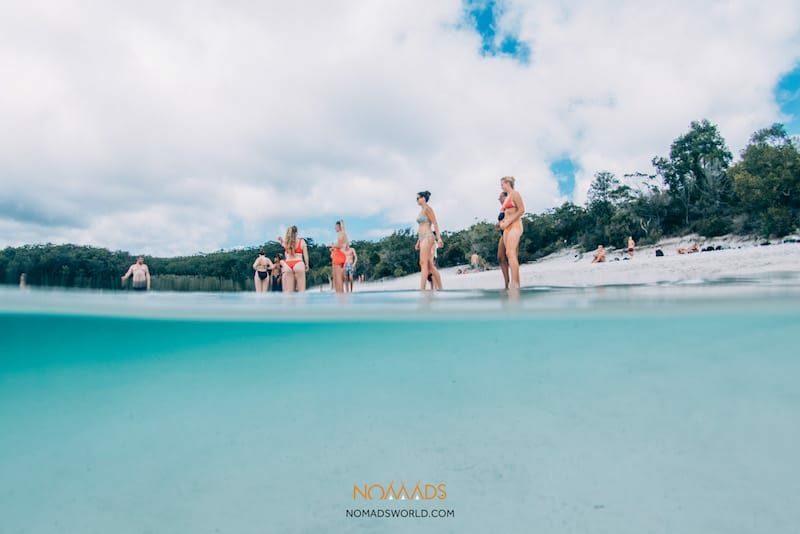 You’ll meet your fellow travellers and learn more about the awesome 3 day Fraser Island tour you’ll be doing! The safety briefing will include driving tips and the do’s and don’ts. Anyone who’s driving will fill in liability and insurance forms as well. After the briefing, pack up a small backpack so you’re all set for your early start the next morning! DAY 1 – We depart from Noosa nice & early at 7:30am so make sure you’re up and ready to go. After your luggage is safe in storage we’ll be heading towards Rainbow Beach (a 1.5-2hr drive). We stop at Rainbow Beach for a look around and a coffee break. We collect and inspect the vehicles, sign the rental agreements, pay $250 cash bond (refundable) or $10 excess reduction fee (non refundable) for every passenger to pay whether eligible to drive or not. Drivers need to be over 21yrs of age with over 2 years of driving experience with a valid drivers licence (photo copied licences not accepted), and to collect food. Then we’re on our way to the Island! We take the 10 minute ferry journey from Rainbow Beach to Hook Point on the Southern tip of Fraser Island. Depending on the weather, and the tide, your guide will assess whether it’s safe to travel on the beach or if we need to select a different route to the next destination – Eurong Beach Resort – where we have a break and some lunch (delicious sandwiches). After lunch we head inland through some amazing rainforest where we’ll see some of the island’s unique flora and hopefully spot some wildlife too! Our destination for the afternoon is Lake McKenzie, famous for its clear blue water and sandy beach. We then drive back through the rainforest on the way to our accommodation at Eurong Resort, where we’ll be arriving in the late afternoon. After a refreshing shower, it’s dinner time! DAY 2 – Your second day means another early start because we want you to make the most of your time on the island! After a continental style breakfast – cereal, toasts, spread, tea & coffee, we drive up to stunning Eli Creek. This is the largest freshwater creek on the Eastern Coast of the Island. It carves its way through to the beach and pours 80 million litres of water a day into the Pacific Ocean! After spending some quality time here, we’ll be heading up to the famous Maheno Shipwreck. 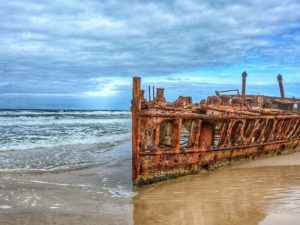 The Maheno was driven ashore on Fraser Island during a cyclone in 1935 and provides you with some awesome photo opportunities. Next up, we continue north past the Coloured Sands comprising of 72 different colours of sand. After a lunch stop (wraps,) and a break, we continue driving up to Indian Head. Indian Head is a large rocky headland, which is great for shark spotting and stunning views over the island! After taking in the breathtaking scenery, we’ll head over to our final stop of the day: Champagne Pools. This is a popular swimming hole with the ocean crashing over the rocks into shallow sandy pools. After an action-packed day we head back to our accommodation at Eurong Resort! DAY 3 – Sadly, it’s our last day on the island already! After breakfast we travel to Lake Wabby, the deepest lake on the Island (11.4 m!) The walk to and from Lake Wabby is an adventure in itself as you find yourself up close to nature and can experience the beauty of the Hammerstone Sandblow. After lunch, it’s time to leave the island at around 2:30pm. Following a brief stop at Rainbow Beach we drive back to Noosa arriving at around 5pm. Just in time for your exclusive post-tour party at KB’s bar with a drink and nibbles! An amazing end to an amazing trip! T&C: Changes permitted up to 72 hours prior departure. Cancellations 72 hours and less prior departure and no-shows will incur 100% cancellation fee. Itinerary subject to change due to tidal and weather conditions. Open dated reservation. Book now and take your tour anytime in the next 12 months (Subject to availability. 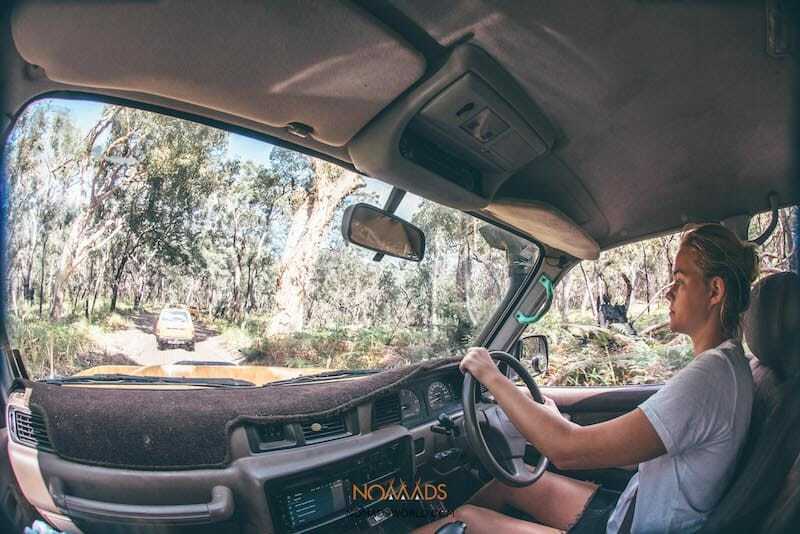 FREE CALL 1800 Nomads or Call Nomads Noosa on +61 7 54473355). It’s recommended to book 2 – 3 weeks prior to your preferred date in peak season (Dec – March). Please note that accommodation in Noosa is not included but can be booked for an additional $10 per night per person. These tours are strictly no BYO. There is a shop at Eurong Beach Resort where alcohol can be purchased as well as a bar. 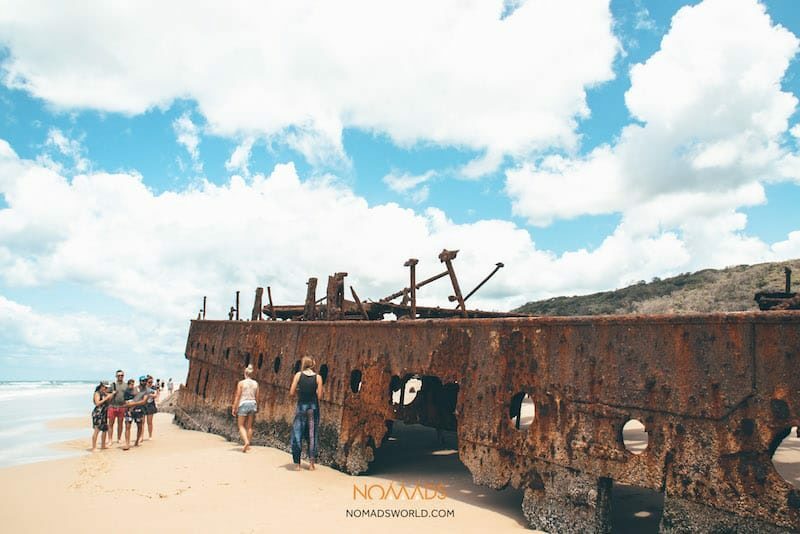 Departs Nomads Noosa, 44 Noosa Drive & Eurong Beach Resort, LOT 201 Williams Ave Eurong, Fraser Island QLD 4581. Passengers must arrive in Noosa by 6pm the night prior to the departure to the Island to attend a compulsory pre-tour briefing held at KB’s Noosa Bar.